Open 24 hours a day, no membership fees, and no commute; this is what you have to look forward to after you complete your at-home gym! This can be an exciting time, but also overwhelming if you don’t know where to get started on your quest to exercise at home. If you build a home gym the right way, it should take a couple of years. You don’t want to build the picture-perfect gym with no money left in your pocket and lots of equipment acquiring dust. Make a plan to grow your gym as your workouts progress. You will commit to more complicated workouts, and will need heavier weights and more equipment to mix up your workouts. When you purchase a piece of equipment, you want to know you are going to use it and it is going to be part of your routine. When planning, think of the cost vs. benefit for each piece in your home gym. If you are a runner and know you will complete most of your workouts in the winter months on the treadmill, you know the workouts you put in will outweigh the cost of the treadmill. You should splurge on this item and buy a state-of-the-art treadmill. If you are just getting into weightlifting, the benefit of an extravagant dumbbell set might not outweigh the cost. Think about what your workouts look like now, purchase that equipment, and build over the next few years. If there are pieces of equipment that are more of a want than a need or you are working on a smaller budget, look into purchasing used equipment. Lots of websites sell gently used gym equipment. Ask your family, friends, and coworkers if they have equipment they don’t use or have suggestions on brands to purchase. If you have no idea where to start, here is a list of a few essentials that are seen in most home fitness centers. Adjustable bench: A sturdy, comfortable bench is vital to your workouts. An adjustable bench can be used in so many different ways. Power rack: If you are looking to lift heavy and do it safely, this piece is a no-brainer. You will bench, squat, press, and deadlift using this machine. Barbell and plates: These can be used for free-standing exercises or along with the power rack. Purchase the weights you know you will use and you can add to your collection over the years. Adjustable dumbbells: They are an investment but will save you money and space in the long run. Piece of cardio equipment: Pick a piece that you enjoy or is right for your budget. These pieces will be pricier, so choose one you know you and your family members will use. After you have the essentials you can purchase some extra fun pieces of equipment that are typically lower cost. These may include jump ropes, resistance bands, stability balls, etc. You will also want to think about where you place your gym, what kind of flooring you use, paint color, windows, display case with awards, motivational quotes, posters, TV, etc. These are things that will be personal preference but are important and will make your gym unique. Include items that motivate you and fit your workout personality. You want your gym to be a place that you can escape to and feel motivated to work toward your goals! What is your favorite in home piece of equipment? Comment below and share with us! As much as a proper warm up and cool down and flexibility, cardiovascular, and strength training are essential to an effective workout regimen, so are progressive overload and periodization. Progressive overload ensures that the program continues to challenge you over long periods of time in order to meet your specified goal. It is important to match any increase in training with an increase in rest and boost strength prior to increasing the overall load. Periodization refers to the planned variation of a program over time. You can’t expect to continue to get results if you do the same workout over and over again. It can be really easy to change up your workout. For example, refer to this previous blog. Repeat the same strength exercises but in a different order and add 3 more repetitions for each one. To mix up your cardio routine, choose a piece of cardio equipment you haven’t used in a while. If you’re cramped for time, don’t worry! A rowing machine is a great way to get a strength and cardio workout at the same time. Check out this site for an overview of Progressive Overload Training. Every peak (shown with a downward pointing arrow) symbolizes a training session or a workout. Directly after each workout, performance drops while your body recovers. Once it has fully recovered, you are in your peak performance time. Follow this with another difficult training session; performance drops again while your body recovers. As you can see in the graph, your performance increases over time using Progression Overload Training. Keep it up and join us next month for Free Workout Fridays! Check out additional videos on our YouTube Channel. It's 2015, a fresh start, a new you and what better way to start following our Free Workout Friday blog? This year we have two new faces to keep you motivated and have scheduled out a year worth of workouts for our readers. Let's start this first Friday off by meeting the faces behind our 2015 Free Workout Friday Blogs. Michelle Adams is a corporate fitness manager in Indianapolis. She began working for NIFS in January 2013. She really enjoys working in the corporate setting because she is able to get a good variety of being active with employees through teaching group fitness classes while also having the opportunity to design wellness and incentive programs. Michelle encourages her members to take control of their own health and is very passionate about helping others with their health and wellness goals. Michelle is currently certified through the American College of Sports Medicine as a Health Fitness Specialist, a group fitness instructor through the American Council on Exercise, and holds specialty certifications in TurboKick and PiYo. 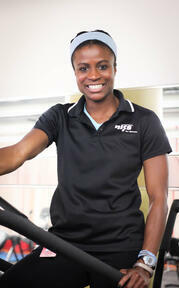 Stephanie Hackett is a health fitness specialist at a corporate client location in Indianapolis. 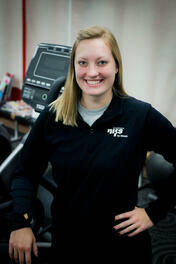 She began with NIFS fitness management shortly after completing her internship with NIFS, Stephanie loves the variety that comes with the corporate fitness setting. She is able to teach classes, personal train employees, and implement health promotion programs. Her favorite part of the job is making those special connections with members to help engage them and keep them coming back. Stephanie is currently certified through the American Council on Exercise as a personal trainer, and is GEAR Indoor Cycling certified through the Aerobics and Fitness Association of America. Now that's you've met our staff behind FWF's, let's get started with Stephanie as she takes you through the components of a workout each week in January! It is extremely important to give your body a proper warm up before starting a workout. For years, static stretching was the norm. Static stretching means holding a stretch in a challenging but comfortable position for generally 10 to 30 seconds at a time. Research has shown that dynamic stretching is better for you before a workout. Dynamic stretching uses controlled movements that bring muscles through their range of motion without exceeding it. It helps promote blood flow through the muscles and to prepare the body to exercise. Start your warm up with a handful of basic movements targeting the whole body. As you become more experienced, use compound movements to warm up. Subscribe to our blog to receive every Free Workout Friday directly to your inbox along with other great content from NIFS Fitness Management! I woke up one morning and my obliques were really sore and tender to the touch. I couldn’t figure it out because I hadn’t taught or taken a core class the day before at my corporate wellness site. Then it hit me that the only thing different I had done was sprints. I hadn’t done sprints since track practice, which was a long time ago, but I had no idea how much I use my core! I loved the feeling of my obliques being that sore, so I decided to start incorporating more sprints into my workouts. Don’t consider yourself a sprinter? That’s ok, I’m not either! Athletes may laugh at my speed but for me it’s a “sprint”. I push myself to run as fast as I can for short periods of time. First, let’s talk about form. Use your arms and core to help pick up the speed. Control your arms and keep them tucked close to your body, elbows at 90 degree angles. Keep your toes straight and lift your knees. Be sure to keep your head/eyes up and slightly lean your upper body forward. The faster you pump your arms, the faster your legs will go! Add some variety to your life and try this sprint workout. Go back & forth with the jog for 2 minutes and sprint for 45 seconds or 1 minute at a time for 20-30 minutes. You can also take breaks to add some pushups or planks in for 1 minute intervals. This can be done anywhere….treadmill, in your neighborhood, on an actual track, or anywhere else that you have an open space and is a safe environment. The number-one challenge that the aging population faces is balance because the number-one concern is falling! In order to maintain balance, you must balance your day to include balance exercises! A wise person once said, “Practicing balance doesn’t make perfect; practicing balance makes permanent!” Therefore, include specific balance exercise daily, incorporate them into your exercise routine, provide a variety of balance exercises, and do different ones daily to challenge your stability. Goal 1: Establish a Routine. What’s the first thing you do when you get up in the morning? You usually head to the bathroom, take a shower, brush your teeth, and so on. It’s a consistent routine. So is practicing balance! Find the time, whether it 's before or after exercising, after breakfast, or before bed. Schedule in a few balance exercises and make it part of your routine. Goal 2: Think Before You Start. Wear proper shoes. Your ankles and feet need good support. No sandals or fancy shoes! Utilize your strong muscles. Strengthen the muscles that support the body (especially the lower legs and ankles). So make sure your exercise routine includes strengthening these areas. A mirror is helpful. Look at yourself when you attempt to balance, check your posture, and note what your limitations (such as knee replacements or back issues) permit. Stand on good flooring. Do your exercises on stable and level ground. If one side is higher or more unsteady than the other, you will be the same. Use stable support. Make sure that there is a stable chair or counter available. As you practice, you will need an occasional support when you feel unsteady. The main goal is to prevent falling. Avoid fast movements and position changes. Slow down! Learn to turn and react with deliberate patience. 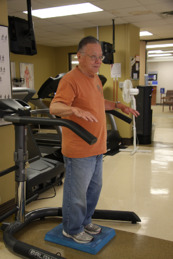 Incorrect weight shifting is the number-one cause of falls. So when you go to move or turn, remember to be as cautious as possible. What’s the real hurry? Let your body catch up with your mind’s intent. Goal 3: Practice Being Unsteady to Become Steadier. Sounds silly, doesn’t it? Practicing exercises that force the body to feel unsteady actually helps the body become steadier. That being said, you should also continue to challenge the body. For example, if you’re capable of supporting yourself by raising both arms out and holding them for 10 seconds, next you can incorporate holding on with one hand and lifting one leg out to challenge yourself. Eventually and over time you can regain better balance. Are you ready to make a change in your life? 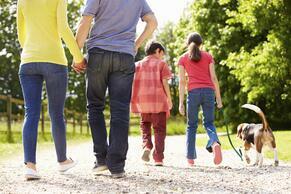 Have you been busy with a career or raising a family and put working out on the back burner? Most people’s activity level tends to significantly decrease in their 30s and 40s, and it only continues from there. It’s time to focus on you and spend just a few minutes each day doing something for yourself. I understand this is easier said than done, so I’ve created a workout to get you started that can be done in your own home with no equipment required. All you need is an open space on the floor. This workout is designed to be challenging but not impossible. Do what you can and work your way up to going through it all, and eventually go through it twice! View the video for a brief demonstration for the exercises in the workout below. This workout can be done with modifications or added intensity if you are up for the challenge! This is intended to be done two to three times a week in combination with other forms of physical activity and a healthy diet. Don’t forget to drink plenty of water and stretch at the end of every workout.